The Basic Workflow is the same since LRT3. You can use it for simple sequences or sequences shot in JPG. A better choice would be converting JPG sequences to DNG with Lightroom and then using the Visual Workflow too on those DNG-sequences. If you shoot in RAW, please always use the Visual Workflow instead. Load your time lapse sequence by choosing a folder on the left. Wait until the sequence has been loaded. Keyframes Wizard: drag the “Number of Keyframes”-Slider until you get the number of desired keyframes. 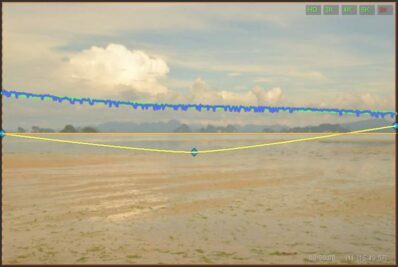 Keyframes will mark the images, that you are going to edit manually – the develop-settings for all other images will be calculated automatically by LRTimelapse. Save your sequence, then make sure Lightroom is open and the Library Module selected. Bring your sequence to Lightroom and make sure the XMP-Metadata that LRTimeapse wrote, gets applied. Drag the button named Drag to Lightroom into the Lightroom Library. This will invoke the Lightroom importer. Detailed explanation: before dragging, make sure that Lightroom is opened and the folder you are working on has not been added to the Lightroom catalog before, and if, remove it from there. Make sure that Lightroom is in Library module. Then go to LRTimelapse click and hold on the button “Drag to Lightroom“, then drag your mouse while holding the button over the Lightroom icon in the dock or taskbar. Hover there for a moment until Lightroom comes up. Now go with the mouse over the Lightroom window and drop it there (release the mouse button). You’ll see, it’s very easy once you did it. Make sure that Add is selected at the top (not copy!!) then import to add the images to the Library. make sure the Filter is set to LRT5 Full Sequence. select Metadata->Read Metadata from Files from the menu. Select the right filter in Lightroom’s filter chooser above the filmstrip. If you don’t see the filter panel, just click on “Filter”. You can speed up this processing by setting the filter to “Speed up Lightroom!” while the metadata is being read. Now your sequence is in Lightroom and you should see the keyframes that you created in LRTimelapse as ****-Ratings. Select the filter “LRT5 Keyframes” to see only the keyframes. The left keyframe is the “most selected” – you’ll sync it’s settings to the other keyframes with the “LRTimelapse Sync Keyframes”-script. The current keyframe will then be “most selected”, the others selected a bit darker. Now launch LRTimelapse Sync Keyframes from the Lightroom Scripts-menu – this will apply the settings from the first keyframe to all others. Advanced tip: please do not use copy/paste or the native synchronize in Lightroom, instead please use the new script in general. Should you need to synchronize single tools only, like crop, you can use copy/paste or synchronize, but make sure to exclude the gradients then! Switch to the next keyframe and make your changes in editing, if needed. You can change any tools you want (with few exceptions). If you work with Gradients, please don’t create new ones – always use the predefined gradients that LRTimelapse created. And please don’t delete Gradients! Lightroom 5 and older: If you edited the crop, you will notice that the Sync-Keyframes Script does not Sync the crop (due to Lightroom restrictions). In that case just synchronize only the crop to all keyframes with the Synchronize button in Lightroom. Edit all keyframes like this. After each one, select the current one, then shift select the last one and launch the LRTimelapse Sync Keyframes script. Now save the changes: make sure, that again (like always when working with metadata) you are in Grid View (G), all keyframes are selected (Ctrl-A) and then use Metadata->Save Metadata to Files from the menu or Ctrl-S.
Go Back to LRTimelapse and proceed with the second row of workflow buttons. Auto-Transition will calculate the transitions for all images in between the keyframes. It will give you a short glimpse on all curves calculated in the preview, you might permanently turn on the display of all curves by clicking on “ALL” on the top right of the preview. If you feel that your sequence has flicker you can now use the deflicker option. The blue curve shows the luminance of the previews. The more spikes you have, the more changes in brightness. 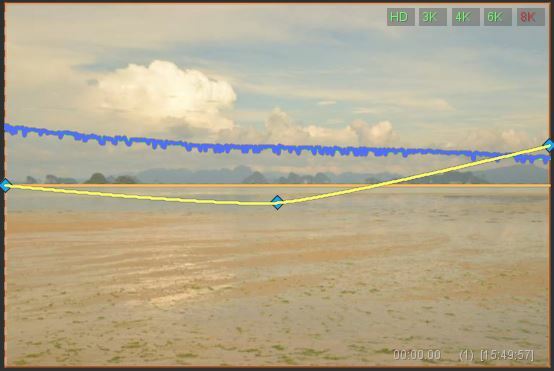 The yellow curve with the keyframes is always the curve showing the “Exposure” set in Lightroom. The blue curve shows the luminance of the original files. In this case it’s rather bumpy, this is a sign of flicker. You can play the sequence via the “Play-Button” below the preview to see, if flicker is visible as well. If so, click on the Deflicker button, if you have a rather smooth curve instead, don’t use Deflicker. Simple deflicker with Smoothing Slider. Only deflicker, if you really have flicker! If your curve is not so smooth, scrub though the sequence and try to identify why you have those bumps in the curve. In the example above, it’s clearly flicker – there is not much happening in that scene and the flicker is very regular and frequent. You might have frames in your sequence where people get in or other natural movements. Those might be darker then others, leading to a peak in the luminance curve. If so, and you can identify an area in the sequence, that would serve as a better reference for calculating the luminance curve, try selecting it by clicking and dragging in the preview. This will recalculate the luminance curve and not use the whole frame anymore but the area, that you’ve selected. The goal should be to find an area, where the flicker effect is isolated, and you don’t have other short term changes in brightness. This is explained in depth in my EBook. If you click on Deflicker, you’ll get a Smoothing slider and a new, green curve. Drag the slider, until the green curve looks like you would like the blue curve to ideally be. Don’t overdo it. The green curve shows a smoothed version of the blue luminance curve and should look like you would like the blue curve to be. Grid-View (G), Select all (Ctrl-A), Metadata/Read Metadata from files. You’ve got it. Now all images in between the keyframes should get their edits. But you don’t have to wait, until Lightroom finishes updating the previews, just proceed with exporting your sequence. You’ll find the explanation for exporting in the Export and Render instructions.